Spring is for making Nettles Sing instead of Sting! Nettles--a common weed--are the superfood of springtime, boasting high levels of protein and plant-digestible iron, and are also high in vitamins A, C, and D as well as calcium, potassium, and manganese. To eat nettles, you have to know how to identify and where to find them, and then how to render them stingless. It's also helpful to know how to recognize the common dock weed, and/or jewelweed, since their leaves take away the sting of nettles should you be unlucky enough to brush up against one. Nettles are a common native plant in the Pacific Northwest; they have developed stinging cells as an adaptation to deter herbivores from eating them. The plants contain long, thin, hollow hairs that cover the majority of the stem and the underside of the leaves. Nettle stings contain acid (formic acid) but they also contain histamine and other chemicals. The exact details are still unknown but it is the histamine that causes the initial reaction when you are stung. The sap from dock or jewelweed leaves (other familiar plants in the PNW) contain a natural antihistamine, which helps to ease the stinging sensation. Pacific Northwest nettles can be found near damp forrest edges and wetlands. One once showed up in my front flower bed in early spring; I recognized it as a familiar plant but couldn't place what it was, and carefully weeded around it, thinking it was an ornamental. Finally, when it was about 18" tall, I brushed up against it and realized I had been carefully tending a stinging nettle plant! 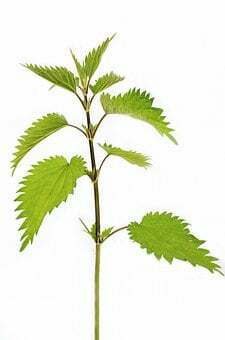 The nettle plant has tiny hairs up and down the stem and on the undersides of the leaves. They don't look like much, but the lightest touch makes you sit up and notice. Their sting doesn't last long, but isn't pleasant. To render nettles stingless, simply blanch them. When foraging for nettles, wear sturdy gloves and cover legs and arms to avoid accidental encounters. Pick them before they bloom and cut the top three or so bracts of leaves to allow the remaining plant to continue growing. Yesterday we went out in the meadow and found plenty of nettles growing at the edge of the wetlands, and carefully clipped the tender top leaves into clean bags. Two of us collected about three gallons of loose leaves. Once inside, I brought salted water to a boil and used tongs to transfer the leaves into the pot, pushing them down to fully immerse them. I blanched them for 4 minutes, then drained and let them cool before squeezing as much moisture out as possible. We ended up with about 2 packed cups of cooked nettles. Into the food processor went 1 cup of toasted pine nuts and 1/2 cup of peeled fresh garlic and 1 teaspoon of sea salt. I pulsed this mixture gently until just chopped. Then I added in the cooked nettles, 1 cup of olive oil and 1/2 cup fresh lemon juice and pureed until the mixture was thoroughly combined. This created a bright, flavorful pesto with a garlicy punch, which made about 4 cups of pesto. There is no need to go all scientific with this recipe; simply adjust the amounts of your pesto to suit your taste, and feel free to experiment with the addition of black pepper, red pepper flakes, parsley, etc. For dinner last night, we cooked up an easy, tasty meal of sauteed mushrooms and roasted squash tossed with about 4 cups cooked penne, about 2/3 cup nettle pesto, a little pasta water and topped it off with grated parmesan cheese. A tossed salad and toasted naan rounded out the meal. While eating the leftover pasta for lunch today, we fantasized about making "Nettles Rockefeller" with the first native Washington Olympia oysters of the season due to be harvested tomorrow by the Puget Sound Restoration Fund. Whatever nettle pesto is not consumed in the next day or so will go into ice cube trays to be frozen for future pastas, soups and whatever else the imagination dreams up....who knew getting your vitamins could be wild, dangerous, fun and tasty, all at the same time? Not one to let good ingredients go to waste, this morning I combined the nettle "tea" left from blanching the nettles, along with some dried nettle leaves into a fresh batch of Aloe-Nettle Soap, since once dried or cooked, nettles are known to be a soothing, antiseptic ingredient known to benefit skin conditions such as psoriasis and eczema. Some people say it even helps cellulite, wrinkles and broken nails! Our soaps are all cured for a month. Watch for this soap to hit the shelves mid-May.